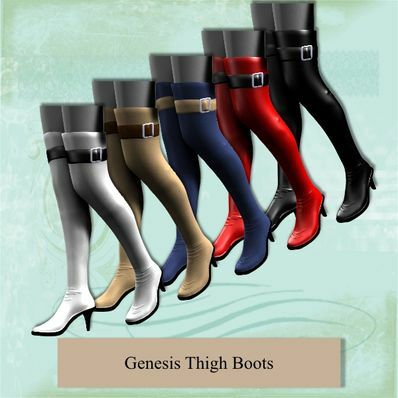 A pair of Thigh Boots for Genesis for use in Daz Studio 4. Boy can I use these. I bet they fit beautifully too. Such a wanted item. Thanks again! Thanks going to try Daz now. Poser user. Thank you, very generous of you. I love this, and so many colors! awesome item, just like all of your stuff! thank you for the share.. I tried to use them on G2f, but it does not work, as the fitting does not properly consider the position of the feet. Might it be possible to make this work?